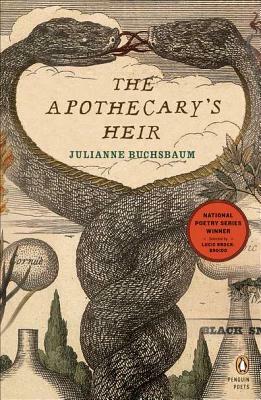 Poet Julianne Buchsbaum has won acclaim for her "rich, lucid, alliterative lexicon, full of apt surprise" (Reginald Shepherd); "there is something of Wallace Stevens in her precision, her incredible diction," says Matthew Rohrer. Her new collection, The Apothecary's Heir, depicts a damaged world in which the speaker is trying to make sense of human relationships in the aftermath of loss. A series of meditations on landscapes of our postmodern world—a sickbed, a gas station, a bomb shelter, a rest stop along a highway—these supple poems explore the frailty of human connectedness and anatomize desire in a world of pharmaceuticals and microchips. Julianne Buchsbaum received an MFA from the Iowa Writer's Workshop and a Ph.D. in literature from the University of Missouri. She is the author of two previous collections of poetry, Slowly, Slowly and A Little Night Comes, and her work has appeared in Verse, Southwest, and Harvard Review among other publications. She lives and works in Lawrence, Kansas, where she is a humanities librarian for the University of Kansas.